Among the jewels of Crimea is the Bakhchisaray Palace. It is the only example of Crimean-Tatar architecture in the world. The history of the Khan's residence is almost 500 years old. The palace building today is a unique monument of Crimean-Tatar palace architecture. It was erected in the middle of the 16th century. The earliest structures of the complex were the Sarah Guzel baths and the Big Khan Mosque, dating back to 1530. The mosque still functions today. A special lodge was built for the sovereign, decorated with stained-glass windows and Iznik tiles. "The Bakhchisaray Palace was not the Khan's only residence," said Anna Polkanova, Deputy Director of the Bakhchisaray Museum-Reserve. "There were five other small Palaces. But the principal residence of the Crimean lord was the Bakhchisaray Palace, built on the orders of Sahib I Giray. 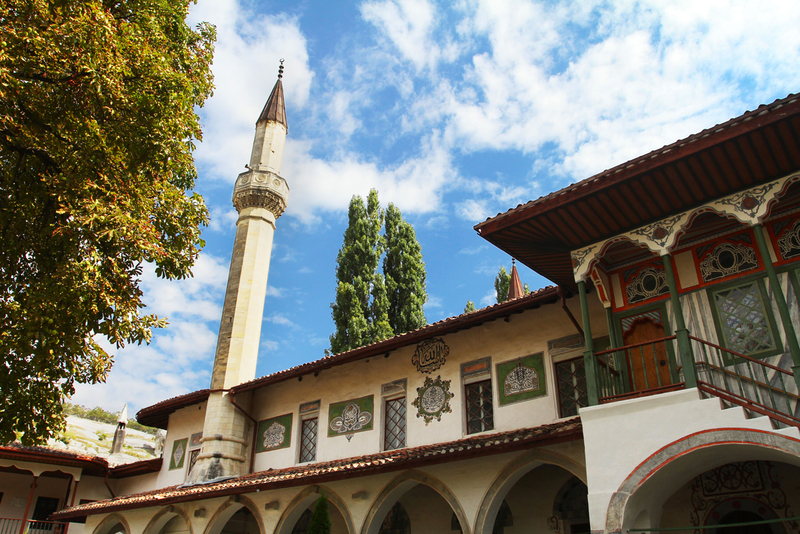 For more than 200 years, the palace was the centre of the Crimean Khanate's political life. Each new leader erected new structures, thus immortalizing his name and forming the edifice that can be seen today. The numerous fountains and gardens eloquently remind us of the palace's name: in Crimean-Tatar, the word "Bakhchisaray" means garden-palace. The estate, a place where one can rest and cool off, embodies the idea of heaven on earth. "The palace compound was built in typical architectural style for Crimea at the time. Besides the administrative quarters, it contained the Khan and his family's private apartments, a library, mosques and other structures," said Polkanova. The Divan Hall is one of the most impressive in the palace. The most pressing issues in the Khanate were decided here. The Khan would sit in his throne, which was wrapped in an orange cloth and decorated with golden needlework. The Khan's confidants were allowed to sit on low sofas and his advisors sat on benches by the wall. The hall still has the 16th century stained glass windows and carved ceiling. The famous architect Omer worked on the palace. His paintings can still be seen in the Big Khan Mosque and the Summer Gazebo. He rebuilt the gazebo in the 18th century, adding another floor for the Golden Cabinet. During the Russian-Turkish War in 1736, the Bakhchisaray Palace was seized by the Russian troops. "Under Field Marshal Minikh's command, the Russian army entered Crimea for the first time," explained Gennady Marshtupa, senior scientific collaborator of the Moscow Historical Museum. "Minikh and his army reached Bakhchisaray and set the palace and the Khan's capital aflame. He then sent a missive to Empress Catherine II about his 'complete victory.'" The palace was later rebuilt, but the description of the compound that Minikh asked his experts to prepare has survived. One of the most famous monuments in the palace compound is the ‘Fountain of Tears.’ According to legend, Qirim Giray Khan ordered it to be built in memory of his beloved Dilyara Bikech and placed it by her mausoleum. The dripping water symbolized his tears of grief and the bowl represented the sorrow filling his heart. Not long before Catherine II's visit, in 1787, it was brought to the court of the fountains. The famous Russian poet Alexander Pushkin visited Bakhchisaray in 1820. Several years later, he wrote a poem called ‘The Bakhchisaray Fountain’, glorifying the palace: "Fountain of love, the living fountain! I bring you two roses as a gift…"
For years now, in accordance with tradition, two roses are placed in the fountain every day. Russian monarchs would frequently come to Bakhchisaray. Catherine II spent three days here. To commemorate her visit a road sign was built, called "The Catherine Mile," marking the empress's journey from St. Petersburg to Crimea. Later, Alexander I, Alexander III and, in 1912, Nicholas II came to the palace. Memorials dedicated to the Russian tsars still stand today. On the 300th anniversary of the House of Romanov in 1913, residents of Bakhchisaray chipped in and built a fountain; the first of a series of monuments constructed for this occasion.